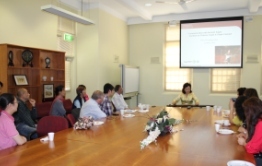 On 11 March 2012 La Trobe scholars and music lovers from the general public gathered at the Boardroom of the Confucius Institute to join in a unique event: a combined seminar and concert of the Chinese guqin given by the master player, Madam Deng Chongying. Guqin is a seven-stringed zither which has been played in China for more than 3000 years. Traditionally favoured by sages and the literati, the guqin is regarded as a symbol of Chinese ancient high culture. Jointly organised by the Centre for China Studies and the Confucius Institute, the purpose of the event was to provide an opportunity for La Trobe staff and students, as well as the local community, to have a deeper understanding and enhanced appreciation of Chinese high culture. At the seminar Madam Deng shared her knowledge and experience of this ancient art then, accompanied by a student, played master pieces of guqin to demonstrate the beauty of the traditional music. Madam Deng took up the Chinese guqin in childhood and learned the art from several high profile masters including Wu Jinglue, Zhang Ziqian and Liu Jingshao. She is a renowned guqin player and has played many successful concerts around the world. In recent years, Madam Deng has devoted most of her time to teaching students this ancient instrument, a few of which have become well-known guqin players themselves, both internationally and locally. “I would make every effort to promote this ancient art. It is so beautiful and should be passed on to the future generation”, said Madam Deng.